Our 31st Annual Research Symposium will be taking place on Thursday, May 30th, 2019. The Research Trainee Competition features Platform Presentations by Residents, Medical Fellows, Medical Students, Graduate Students and Undergraduates. Trainees of any member of the Dept. of Pediatrics or associated to the CHRC are encouraged to participate. Trainee abstracts will be reviewed by a Committee and selected for presentation for the competition. Top presentations from the competition will be selected for Oral Presentation at the Annual Research Symposium. All trainee abstracts will be included in the Research Symposium. There is no need to write two abstracts. 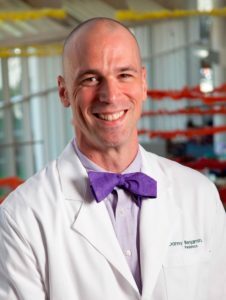 Dr. Benjamin is a, “Quadruple Hoo” who was born at UVA Hospital, completed his undergraduate degree, medical degree, and pediatric residency at the University of Virginia. Dr. Benjamin is the Principal Investigator and Chair of the National Institute of Child Health and Human Development’s Pediatric Trials Network. Dr. Benjamin is recognized by the National Institutes of Health as a premiere mentor and educator. His research program serves as a platform to train students and early career investigators. Dr. Benjamin also, has a clinical research summer program for high school and college students targeting under-represented minority students. Dr. Benjamin is affiliated with Kiser-Arena Professor of Pediatrics, Pediatrics, and Infectious Diseases at Duke University. A professor of Pediatrics, Pediatrics, Infectious Disease and Member of the Duke Clinical Research Institute.